This sounds like a lot of picnics to me! But as this person is in the USA there’s no mention of torrential rain. A lovely family having a picnic–this is not your family. 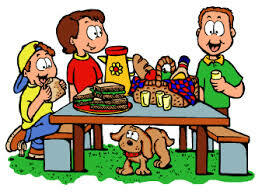 The big family picnic has hit your community like a tsunami and is now slowly receding back into the ocean. Your local emergency room has been taken off high alert and much of their staff has been given a well deserved vacation. Once again your family has overtaxed their staff, frayed their nerves, and extinguished their stock of gauze, sutures and eye patches. Bite wounds–some animal, some human, some unidentifiable, and one that appears to be from a Bigfoot. ‹ PreviousRefusal to admit defeat? Next ›That’s me talking about cartoons on the radio!